Russia's Olga Kaniskina became the first woman in history to retain walk titles at the World Championships in front of the historic Brandenburg Gate Sunday. 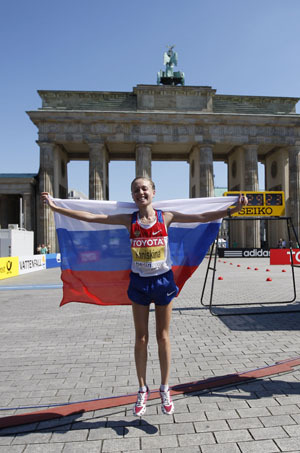 Kaniskina, the reigning Olympic 20km champion, secured her second successive world title in 1:28:09. Olive Loughnane of Ireland surprised all to win the silver medal in 1:28:58 with China's Liu Hong making up for the frustration of finishing fourth at last summer's Olympic Games by taking the bronze in 1:29:10. "Everything went according to our plan of the race," said the Russian gold medallist. "After the fifth kilometer I took the leading position and I focused on my technique. Of course, the hot weather influenced the result and it could have been better (a quicker time) but we train for the competition in every weather." Kaniskina's gold was Russia's second following Valeriy Borchin's victory in the men's 20km race walk on Saturday. Loughnane, meanwhile, had an extra motivation. "I promised my little daughter, Eimer that I was going to bring her a medal, said the Irish race walker. "So, she will be very happy. We all believed that anything was possible." Liu's bronze was China's medal in the women's walk event since Liu Hongyu led home a Chinese one-two in this event in Seville 1999. "I am satisfied because I was 4th at the Olympic Games last year. Before the race my coach told me I could finish in the top 8. But yesterday's silver medal by Wang Hao in the men's event was a big boost. The weather was very hot, but that was rather to my advantage because I am used to that kind of temperatures at home." Liu said.